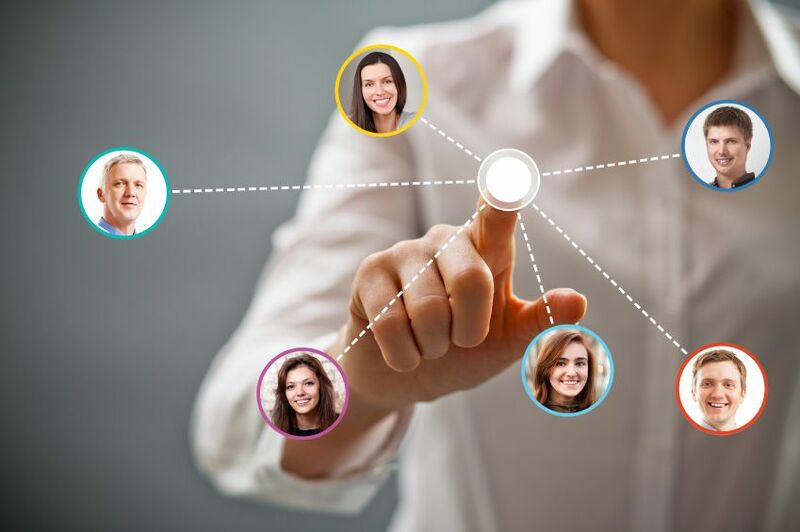 In today’s busy job market recruiters are constantly on the lookout for new technologies to make the hiring process faster, more efficient and better organized. From sourcing candidates to talent management, recruiters are now embracing cloud technologies, which help them streamline the hiring process and choose candidates that perfectly fit the offered positions. Why are cloud solutions important for recruitment? 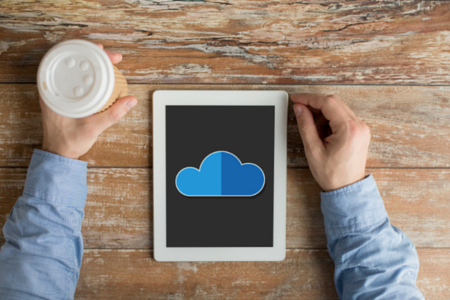 Read on to see how using the cloud can improve your hiring process. Cloud technologies digitize the recruiting process, helping companies to save money on printing and making their hiring process more environmentally conscious. Recruiting involves lots of paper – resumes, application forms, cover letters and assessments are all used during the initial screening and the interview. Using apps based in the cloud, recruiters can digitize the whole process, allowing candidates to upload their documents and keep a close track on their progress in the application process. In order to be successful, businesses need to move fast. Cloud technologies help recruiters access relevant data on demand, without the necessity to store all these files locally and get lost in the process of organizing them. 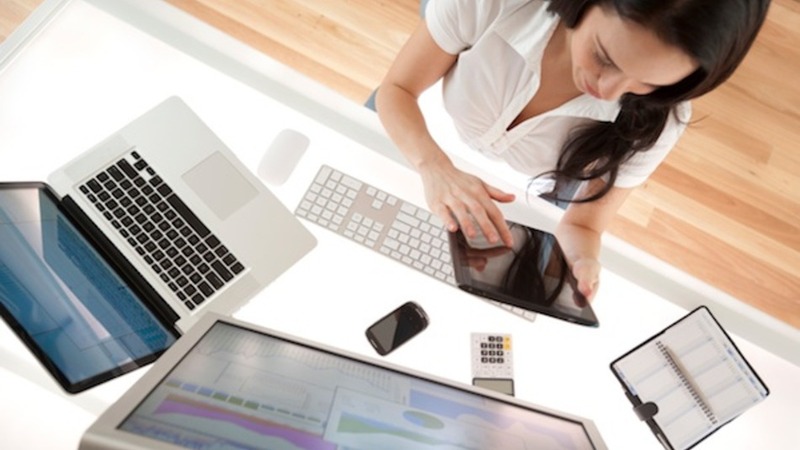 Data can be obtained across all devices, providing crucial HR information when recruiters need it. Where data was previously disparate and disconnected, stored on various computers and devices, now all of it is placed together – offering an easy way for large-scale analytics. HR systems are usually slow and problematic to implement – there are contractors, consultants and customer services involved in the process. Cloud technologies are designed to complement, not replace the existing technologies, and are much easier to implement – they simply don’t disrupt business operations. Implementing a cloud system for application processing takes just a few weeks and doesn’t involve any additional expenses that usually come with setting up recruitment systems. Sourcing talent is becoming increasingly complex and the digital revolution means that there are many different databases for housing candidate information, as well as many different places for reaching passive candidates. An HR software solution in the cloud helps to combine all those potential hiring resources into one comprehensive candidate pool, which is perfect for measuring, tracking and reporting. Cloud-based solutions help recruiters to easily post job openings, create one portal for reaching multiple platforms and standardizing candidate information into a searchable and measurable source. The compilation of various resources into a single candidate pool helps recruiters to process applications faster and instantly spot top talents. Hiring managers can use insights from big data to produce relevant and targeted results, which help to find and compare top talents for a given position quickly. Cloud computing solutions often offer built-in search technologies that are able to combine the employer’s profile, the language of job postings and global candidate databases into a simple resume compilation, which is totally searchable and available from any device connected to the internet. Employers can consolidate internal and external databases and access several platforms at the same time – a great help in finding, developing and pipelining candidates. All in all, cloud computing can make your life much easier – by having access to a constantly updated talent pool, you can use cloud applications to search for suitable candidates and streamline your hiring process, effectively coming up with better hiring solutions in a shorter time frame. This entry was posted in Recruiting Trends, Recruitment Strategy on May 21, 2015 by ZFR. Can You Tell When Your Candidates Are Lying? According to a study carried out by the University of Massachusetts, the majority of people cannot hold a ten minute conversation with a stranger without fibbing at least once. Therefore, realistically speaking you’ll hear (and will have heard) a few porkies during your time in recruitment while interviewing candidates. You don’t need to be a body language expert to notice changes – however subtle – in a person when they’re not being entirely honest. You may literally notice them squirm with discomfort as they try to construct an answer or even shuffling their feet could be a sign that they want to walk away from the situation. Any notable change of or unnatural movements can signify that the candidate is preparing to lie to you such as, wringing their hands, gripping the arms of a chair, picking at skin or moving their head as they search the room for an answer. Liars will often try to ‘cover up’ that they’re being dishonest and will move their hands near their mouth, across their chest, throat or shoulders. It’s said that the eyes are the windows to the soul. They’re also great indicators of how honest a candidate is being. Classic signs would be staring at the floor when asked a ‘tricky’ question while in a 180° turn, an accomplished liar will uncomfortably hold your gaze as if meeting the challenge head on. The best thing to do is establish what you think is normal eye movements for the candidate. Before you get down to their work history and role specific questions; ask something that doesn’t require lots of thought to answer. It could be something as simple as “how long did it take you to get here?” “what did you do at the weekend?” or “do you have any plans for the rest of the day?”. Unaccomplished liars will panic and their eyes may move wildly across the room as they seek out what they think is a satisfactory response. Most people incorrectly assume a high-pitched voice is a sure fire way to identify when someone isn’t being truthful. Yes, your voice can become raised or high pitched due to the stress of lying increasing the heart rate. But it could also be the stress of an interview! However, suddenly dropping an octave, pausing or a change in speed can signal that the answer isn’t coming naturally. Occasionally, if someone is lying they will trip themselves up by leaving you utterly confused by what you’ve just heard. 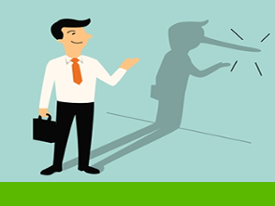 A seasoned liar will have answers prepared for particular topics and will think he/she is covering their back well and creating false trust by going into great detail and volunteering information you haven’t asked for. This is a distraction method – attempting to take your mind off a topic they don’t want to discuss in the hopes of avoiding difficult questions. If you think this is happening; listen to your candidate’s answer then go back and ask for the original information you wanted. Less experienced liars will be more likely to babble – they won’t be able to confidently direct the conversation and there will be lots of opportunity to interject and ask questions. Remember, candidates will be nervous about being in an interview where they’re essentially being judged and analyzed by strangers so some allowances should be made for the situation. However, if you notice a candidate behaving unnaturally, it should raise a flag. Do you want your client to hire someone and second guess their every word? Your gut should help you. This entry was posted in Candidate Selection, Interviewing on May 19, 2015 by ZFR. When thinking about the recruitment process, the candidate’s behavior is often considered more important than the recruiter’s. The candidate may want the job, but the recruiter wants someone to fill the position just as badly. If the recruiter doesn’t pay attention to their own behavior, she risks giving the wrong impression of the company, or even scaring the candidate off entirely. By avoiding the following behaviors, you can attract candidates and give the best impression of yourself and your business. It’s important for the candidate to show they’re serious about the role by arriving for an interview on time, but this also goes for the recruiter. Remember, an interview is an opportunity for your candidate to decide whether they want to work for your company. First impressions count both ways. Speaking of impressions, it bodes badly if recruiters aren’t prepared for the interview. If they spend the first few minutes of the interview reading over a resume, it shows that they aren’t taking the hiring process seriously. Make the time and do your homework on your candidates, and show them that you’re serious about considering them for the job. The culture in your workplace may be informal, but don’t let it bleed into your interview. You may think that casually cursing or over-sharing with your candidate shows that your company is an easygoing and friendly place to work, but it can actually send the message that you don’t take your work seriously. 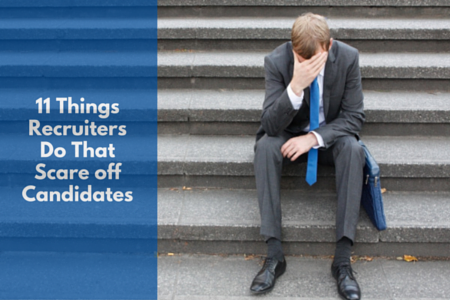 It can also make your candidate wonder what it’s like to actually work with you. You can make the candidate aware of the office culture, but don’t overdo it. If you’re going to decide whether the candidate is the right fit for the role offered, you’re going to need to know exactly what that role is. Merely skimming the job description before entering the interview won’t be enough. Not having this knowledge shows disrespect to candidates too, as they’ve put in the time and effort to prepare for the interview, and their time is just as precious as the recruiter’s. 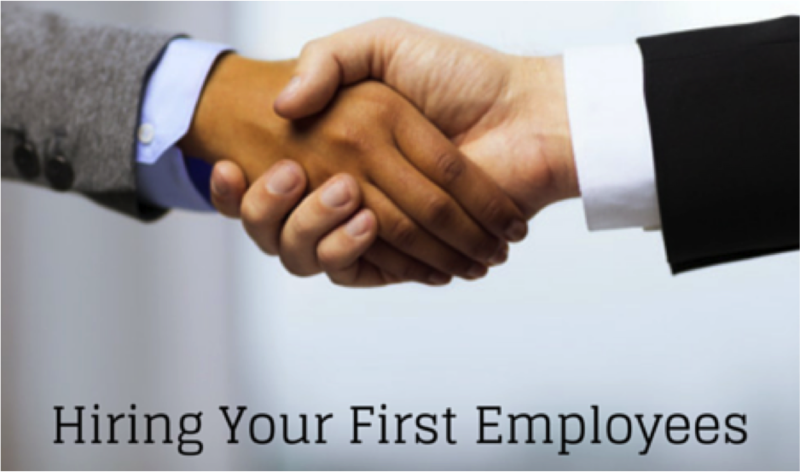 Make sure you know exactly what you need from candidates before you meet them. You may feel that you can conduct the interview without jotting down any notes, but your candidate may think differently. Not taking notes shows that you can either remember everything perfectly, or that you aren’t interested, and no one will think it’s the former. The candidate may draw the conclusion that you don’t care about the people they’re interviewing that day, and that the job’s not important. Do yourself a favor and grab a notepad and pen before entering the interview room. Depending on the role on offer, there may be several checks and interviews you have to do before you can offer a candidate a job. However, if they’re already experienced and you’re putting them through multiple tests, they could well be turned off by your company. They’ve already proven their worth and gained their experience elsewhere. Avoid dragging out the process and potentially frustrating an excellent candidate. To decide whether you want a candidate, you need to let them tell their story and demonstrate just why you should hire them. However, many recruiters make the mistake of taking over the conversation and making it about themselves. Make sure the conversation is actually a two-way dialogue, and allow candidates to sell themselves. Attracting the best candidates means writing the best ad you possibly can. If your ad is poorly worded, too vague or full of meaningless buzzwords, then many candidates will stay away. Give enough information to entice candidates to apply, and make it precise enough to attract the right people for the role. Take APG Exhibit’s employment page, for example. It lists quantifiable, minimum requirements while also sharing the benefits, including the opportunity to work from home. It also has a very visible “Apply Now” button that clearly directs visitors to the next step. On the other hand, it’s tempting to write a detailed, exhaustive list of all the qualifications your candidates should have. Resist this temptation, as being too specific in what you want can turn candidates away. People won’t apply for the role if they feel they can’t fit a precise specification of a dream candidate that could only exist in a fairy tale. Keep your expectations realistic and list only the essential requirements. You may get applications from candidates that may not entirely match your specifications, but don’t dismiss them out of hand. Sticking rigidly to a defined set of rules can mean that you’ll let fantastic candidates slip through your fingers. 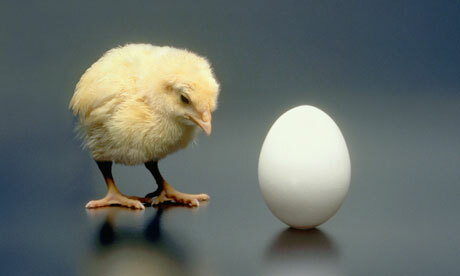 Remember, the experience an applicant has may translate well into a different role. Keep an open mind and you’ll find you’ll have a much wider pool to work with. Anyone who’s ever interviewed for a job knows how awful it is waiting for a response. If you neglect to keep your candidates in the loop, they may well go looking for better offers by the time you get around to them. 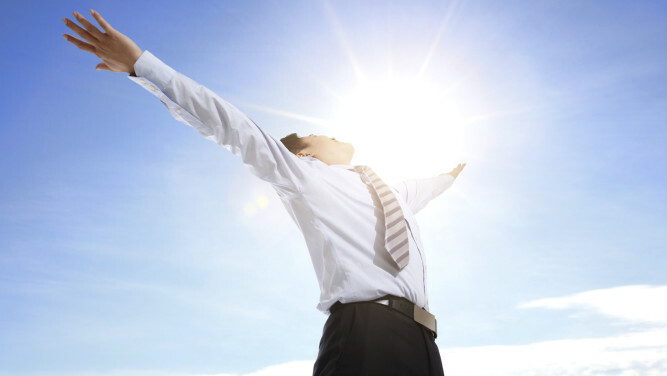 Conversely, make offers of work too soon and it can seem that you’re looking for any warm body to fill the role. Keep them informed of your process, and they’re more likely to keep you in mind as a potential employer. Most of the above is common sense, but it can lost in the chaos that is hiring a new employee. Remember that your candidates are human, and they’re sizing you up just as much as you them, and you’ll be able to attract the best people for the job. This entry was posted in Interviewing, What NOT To Do on May 8, 2015 by ZFR.